This is a new role. Its purpose is to increase the awareness of Bees Abroad amongst the 25,000 members of UK beekeeping associations. Generous beekeepers currently provide a large proportion of our income. However, awareness of Bees Abroad is very limited and by increasing our focus on beekeepers we know there is considerable potential for additional income. The are many ways of achieving this e.g. Regularly targeted mailings to beekeeping associations with appealing content. Increased attendance at beekeeper’s conferences. A programme of presentations at meetings of beekeeping associations. Greater use of social media. Personal networking…we are all beekeepers, we all have contacts but we need a methodical approach to exploiting them. We need a volunteer beekeeper to join our fundraising and communications team to develop and implement a plan to which the whole Bees Abroad team can be harnessed to support. Project Manager – what does it involve? Making sure that applicants are suitable beneficiaries. This usually happens in country face-to-face. Project design, budgeting, planning and approval. Monitoring and managing project delivery. This involves in-country visits and sometimes delivering training and training and assessing local trainers. For our current projects please visit our projects page. A competent beekeeper beyond BBKA Basic Assessment level – and not just with gentle bees. Familiar with general business skills. Our projects are about setting up small businesses, not just beekeeping. An excellent communicator and networker, particularly good at listening, sensitive to other cultures, tactful and diplomatic. Highly capable in planning and organising, including financial control. Able to work in difficult conditions and not risk-averse. Enthusiastic, flexible, able to work alone and take responsibility yet a keen team player too. Available for sufficient time to maximise success. If you have already managed beekeeping projects in the developing world why not get in touch? We can offer the opportunity to share knowledge with our team and the benefits of being part of an organisation dedicated to the relief of poverty through beekeeping. There are sometimes opportunities to travel to a project or projects with an experienced Bees Abroad project manager. You will need to fund your own costs (or fundraise to do so) and should budget in the region of £1500. There are some suggestions below about raising funds. We can help with visits for individuals to existing mature projects in Kenya or Uganda to observe and learn about the challenges of beekeeping in Africa. Again you will need to self-fund or fund-raise for this initial visit and the cost is typically £1000 to £1500. Self-Funding – Donations of personal funds to Bees Abroad which are then used for visits attract gift aid of 25% if the donor is a taxpayer. Local Beekeepers – A recent recruit convinced her local Beekeeping Association to give the money made from their annual raffle to help fund her visit and to give any surplus to Bees Abroad. The raffle raised £1300 which Santander Bank agreed to match fund to a tune of £1000. A school at which one of her friends does some beekeeping work raised £163 in a bucket collection. Result £2463 raised in 5 months. Relatives and Friends – ‘No birthday presents thanks – give to Bees Abroad this year’. Buy & Sell on eBay – it works for one of our project managers for continued project funds. Swarms & Nuclei – Ask for donations to Bees Abroad when you collect a swarm or give bees away. We recognise that our expertise in, and understanding of, the effective use of social media as a route to fundraising is lacking. We are therefore seeking a volunteer to educate us, provide practical help and ongoing coaching. This be could be as a project, a secondment or as a part-time volunteer. We are open to all offers and suggestions. Your contribution will help us increase our online visibility and impact. In addition, you will learn about the wonders of honey bees and beekeeping; we could even help you become a beekeeper. We would like to expand our fundraising and communications team to include someone who can focus on gaining support from corporate sponsors. The role will involve identifying organisations likely to be sympathetic to our work and persuading them to support us. Corporate sponsorship is a new area of fundraising for Bees Abroad and one we think has potential to become a significant part of our income. You will be joining an enthusiastic group of volunteers committed to the success of Bees Abroad. Many of us are beekeepers but it is not a requirement. Interested? Please email our chairman richard_ridler@beesabroad.org.uk or phone 01799 218023 to find out more. We would like a show manager to understudy our existing volunteer. 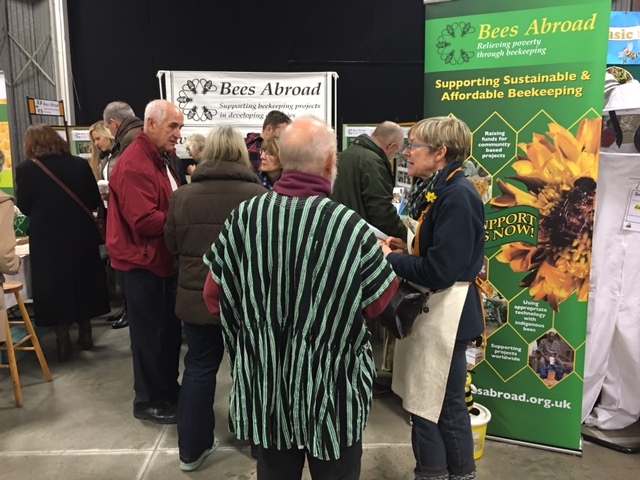 We aim to attend ten shows around the country each year to recruit supporters, fundraise and promote Bees Abroad. Shows include the BBKA Annual Convention, the National Honey Show, the Great Yorkshire Show and the South of England Show. Please email our chairman richard_ridler@beesabroad.org.uk or phone 01799 218023 to find out more. We are searching for new trustees to strengthen our board and help implement the changes essential to secure our future and implement our strategy. Our mission is the relief of poverty through beekeeping in any part of the world. Our vision is to be be the Go-To International Leader in building sustainable beekeeping enterprises for those in poverty. Our team of volunteer beekeepers and local trainers work with selcted groups to establish social entreprises based on beekeeping. The sale of honey typically increases income by 20% and improved pollination increases crop yields. We are interested in hearing from you whatever your background and expertise. We don’t specify a time commitment, the more the better! Trustees meet by teleconference on the fourth Monday evening of every month. Our AGM takes place on a Sunday 8th April 2018 at Stoneleigh Park, Warwickshire. The role is entirely voluntary, no remuneration is offered. Trustees have and must accept ultimate responsibility for directing the affairs of the charity, ensuring it is solvent, well run, and delivering the relief of poverty through beekeeping. New trustees without prior experience will be expected to attend a short course on charity trusteeship. It is not a requirement to be a beekeeper but commitment to and enthusiasm for our work are essential. We are searching for new trustees to strengthen our Board and help implement the changes essential to secure our future and implement or strategy. Our mission is the relief of poverty through the craft of beekeeping in any part of the world. Our vision is to be be the Go-To International Leader in building sustainable beekeeping enterprises for those in poverty. Our team of volunteer beekeepers and local trainers work with selcted groups to establish social entreprises based on beekeeping. The sale of honey typically increases income by 20% and improved poliination increases crop yields. We don’t specify a time commitment, the more the better! Trustees meet by teleconference on the fourth Monday evening of every month. Our AGM takes place on a Sunday in April at Stoneleigh Park, Warwickshire.